One of the Museum's Pup aircraft, Betty/Phyllis, over the BC forest. The Sopwith Pup was a British single-seater biplane fighter aircraft built by the Sopwith Aviation Company. It entered service with the Royal Flying Corps and the Royal Naval Air Service in the autumn of 1916. With pleasant flying characteristics and good manoeuvrability, the aircraft proved very successful. The Pup was eventually outclassed by newer German fighters, but it was not completely replaced on the Western Front until the end of 1917. In 1915, Sopwith produced a personal aircraft for the company’s test pilot Harry Hawker, a single-seat, tractor biplane powered by a 50 hp Gnome rotary engine. Sopwith next developed a larger fighter that was heavily influenced by this design, though more powerful and controlled laterally with ailerons rather than by wing warping. The resulting aircraft was a single-bay, single-seat biplane with a fabric-covered, wooden framework and staggered, equal-span wings. The cross-axle type main landing gear was supported by V-struts attached to the lower fuselage longerons. The prototype and most production Pups were powered by the 80 hp (60 kW) Le Rhône 9C rotary engine. Armament was a single 0.303 inch (7.7 mm) Vickers machine gun synchronized with the Sopwith-Kauper synchronizer. A prototype was completed in February 1916. The Royal Naval Air Service (RNAS) quickly ordered two more prototypes, then placed a production order. The Royal Flying Corps (RFC) also placed large orders for Pups. Deliveries did not commence until the beginning of 1917. A total of 1,770 Pups were built by Sopwith (96), Standard Motor Co. (850), Whitehead Aircraft (820), and William Beardmore & Co. (30). The Pup’s light weight and generous wing area gave it a good rate of climb. Agility was enhanced by installing ailerons on both wings. The Pup had half the horsepower and armament of the German Albatros D.III, but was much more manoeuvrable, especially over 15,000 ft (4,500 m) due to its low wing loading. By the spring of 1917, the Pup had been outclassed by the newest German fighters. The RNAS replaced their Pups, first with Sopwith Triplanes, and then with Sopwith Camels. The RFC soldiered on with Pups, until it was possible to replace them with Camels in December 1917. The raids on London by Gotha bombers in mid-1917 caused far more damage and casualties than the earlier airship raids. The first Pups delivered to Home Defence units utilised the 80 hp Le Rhône, but subsequent Home Defence Pups standardised on the more powerful 100 hp Gnome Monosoupape, which provided improved rate of climb. Sopwith Pups were also used in many pioneering carrier experiments. On 2 August 1917, a Pup flown by Sqn Cdr Edwin Dunning became the first aircraft to land aboard a moving ship, HMS Furious. The Pup began operations on the carriers in early 1917. Landings utilised a system of deck wires to “trap” the aircraft. A number of other Pups were deployed to cruisers and battleships where they were launched from platforms attached to gun turrets. The Pup saw extensive use as a trainer. Student pilots completing basic flight training in the Avro 504k often graduated to the Pup as an intermediate trainer. The Pup was also used in Fighting School units for instruction in combat techniques. The Pup was officially named the Sopwith Scout. The “Pup” nickname arose because pilots considered it to be the “pup” of the larger two-seat Sopwith 1½ Strutter. All later Sopwith types apart from the Triplane acquired animal names (Camel, Dolphin, Snipe etc. ), which ended up with the Sopwith firm being said to have created a “flying zoo” during the First World War. The Sopwith Aviation Company was created in June 1912 by Thomas Octave Murdoch (later Sir Thomas) Sopwith, a well-to-do gentleman sportsman interested in aviation, yachting and motor-racing, when Sopwith was only 24 years old. Following their first military aircraft sale in November 1912, they moved to the company's first factory premises opened that December in South West London. During the First World War, the company made more than 16,000 aircraft and employed 5,000 people. Many more of the company's aircraft were made by subcontractors rather than by Sopwiths themselves. After the war, the company attempted to produce aircraft for the civil market based on their wartime types, such as the Dove derivative of the Pup and the Swallow, a single-winged Camel, but the wide availability of war-surplus aircraft at knock-down prices meant this was never economic. Upon the liquidation of the Sopwith company, Tom Sopwith himself, together with Harry Hawker, Fred Sigrist and Bill Eyre, immediately formed H.G. Hawker Engineering, forerunner of the Hawker Aircraft and Hawker Siddeley lineage. Sopwith was Chairman of Hawker Siddeley until his retirement. Hawker and its successors produced many more famous military aircraft, including the inter-war Hart, and Demon; World War II's Hurricane, Typhoon, and Tempest; and the post-war Sea Fury, Hunter and Harrier. The Canadian Museum of Flight, in association with Sound Ventures and The Royal Canadian Geographic Society, participated in the First World War commemorative project Wings of Courage, and Flight Path of Heroes as part of the 'A Nation Soars' program. 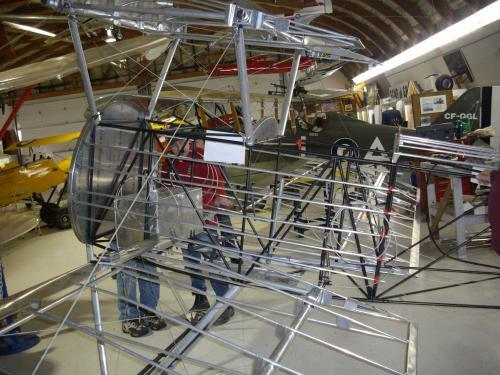 The CMF was tasked with building, then flying, two replica Sopwith Pup biplanes. Once completed, the two planes were formally gifted to the CMF to become part of a permanent exhibit. The Pup replicas that the Museum built are ultralight aircraft from Airdrome Aeroplanes of Holden, Missouri. The company supplies kits for many WW1 aircraft in two classes – Allies and Central Powers. The aircraft are externally similar to the originals, however modern materials and construction techniques are used. The structure is metal and the fabric covering of synthetic material compared to the wooden structure and Irish linen covering of the original. A technical team from the Museum spent two weeks at the factory doing the initial construction of the aircraft and studying the requirements to complete the aircraft once back at the Museum. They then put their studies into practice as shown on the Museum website. For the Pup project a modern engine was chosen that has a proven reliability record in small aircraft. The engine is a Lycoming O-235 four-cylinder, air-cooled, horizontally opposed piston engine that produces 115 hp (86kW) at 2700 RPM. Guns: 1 × .303 in (7.7 mm) Vickers machine gun synchronized to fire through the propeller. Progress Reports on the build of the replica aircraft. March 10 - Moving Day at the Museum. At the completion of testing and photography all three aircraft - the SE5A, Pup No. 1 and Pup No. 2 - were dismantled for transport to the Comox AFB for shipping to France via the giant RCAF C-17 transport. Volunteers wrap one of the wings securely to prevent damage during transit. Volunteer, Sam, briefs the CBC photographer on details of the completed Pup No.2. The white colour of the horizontal tail denote that the aircraft is flown by the Squadron Commander. Will it fit? The fuselage of Pup No. 1 is lifted toward the 100-inch high doorway. Yes! With judicious wiggling - and lowered pressure in the tires - the Pup is ready for transit. There is also room for the SE5A in the truck. Last of all, Pup No. 2 goes through the ignominious process of being shorn of her tail feathers. Bon voyage, our feathered friends! The pace continues with the Museum's goal of having some of its aircraft fly at the Vimy celebrations in France in April. Even with the adverse weather, publicity flights were made for the media. Pup No. 2 had engine runs and taxi tests in wintry rain conditions. In wintry conditions the SE5A and Pup No. 1 prepare for departure. The SE5A heads off from Langley toward the spectacular mountains of the Fraser Valley. Bruce, in appropriate clothing, checks to see that all his hard work is performing as expected. "HAPPY, did you say?" Well, yes, as the aircraft performed as expected. Museum Manager, Mike, is enjoying his duties. Taxi tests and engine run-ups confirmed the soundness of Pup No. 2. So, when was the last time you saw two flightworthy Sopwith Pups at the same airport? Probably at the Museum in Langley. But now the big move is under way - the SE5A has its wings removed for transport to France. has done his magic with factory-perfect lettering on the vertical fin. The three Museum biplanes heading for Vimy: The SE5A (left), Pup No. 1, and Pup No. 2 (right). Wayne and Peter all contribute with their centuries of aviation experience. but there are limits to how many hands can fit in the limited space. While the frequent bursts of snow are playing havoc with the test flight schedule of Pup No. 1, the time is being used to make a few improvements to the landing gear. Pup No. 2 is rapidly taking shape to make its first flight. and the nose cowl is being installed - Bruce and Sam at work. Tuesday, 21st was a Fly Day for the Pup. With a break in the extreme weather it was a good opportunity to progress with the test flying of the first Sopwith Pup. After a brief run, Allan Snowie takes Pup No. 1 into the air at Langley Regional Airport. Into a wintry sky the Pup rapidly gains altitude, its Lycoming engine purring away. air molecules, rather than a dastardly enemy. Keeping the Pup company was the Museum's SE5A flown by Al French. Meanwhile the fabric covering for the fuselage of the second Pup has been completed. The replacement engine in position on Pup No. 1. Volunteers, Sam, Bruce 1 and Bruce 2 discuss the installation of the ducts for the cooling airflow. The test flight of the first Sopwith Pup built by the Museum to take to the air was cut short by engine difficulties. Shortly after takeoff, the pilot, Allan Snowie, noticed the engine was overheating. This was followed by the engine shutting down. He advised the Control Tower of the difficulties, received immediate clearance to land, restarted the engine and landed back at the airport. The aircraft was taxied back to the Museum under its own power. Test pilots earn their keep! Upon examination, the engine was observed to have low compression in one cylinder. When the engine was stripped down it was noted that there was internal damage to the pistons and cylinders. The engine for the second Pup was also examined and internal abnormalities were found. Both engines were provided as new and even though they had only short ground runs at the Museum they were exhibiting unusual characteristics. The decision was quickly made to replace the engines with those from a certified factory – in this case the Lycoming O-235 four-cylinder engine, as used in numerous light aircraft. Other museums and private owners have stepped up and offered engines on a loan basis. Now the Museum’s tech crews will have to start the whole engine installation process again. Not something that was in the plans, but that’s what is amazing about our volunteers – when there is a challenge, they are right there to get on with it! Yes! Pup No. 1 has left the shelter of the hangar and joined the airborne Museum fleet. On 12 January, 2017 the Pup was taken into the air under the guidance of veteran pilot, Allan Snowie. The Pup took off to the north at Langley Regional Airport, made a short flight and landed to the east. Pilot, Allan Snowie, settles into the cockpit for pre-flight checks. The Pup taxies out at Langley Regional Airport in preparation for its first flight. Into the air for the first time! The Pup soars over the Coast Mountains. The winter snow of the Golden Ears is the backdrop for the first flight of the Pup. Progress on the build and operation of the first of the two Sopwith Pup replicas is almost finished with the official paperwork complete. The Special Certificate of Airworthiness that confirms that the Pup meets all regulatory requirements. before it can fly, fortunately, does not apply to the Pup! Pup No. 1 is awaiting suitable weather to take to the air. Final inspections are being carried out while time permits. A face that every mother dog would love - the smile of a Pup. Meanwhile, Sam works his magic on the upper wing of Pup No. 2. The fuselage of Pup No. 2 has been rotated in the fixture to allow installation of the landing gear. Completion of the pair of Pups is moving forward steadily. While Pup No. 1 waits for final takeoff clearance, construction of its sibling continues. A pair of wings await the application of the final color scheme. The covering process for all the wings and flying surfaces is now complete. (rear) shows its true colors. The royal color scheme on the rudder is being applied. is about to start. Last minute addition of controls and wiring is under way. Steady progress is being made on Pup No. 1 being made ready for flight. Phil checks the Pup for level attitude before the aircraft is weighed. And, yes, it passed with flying colours. Bruce keeps his head down as he installs avionic equipment. Not far behind in the construction process is Pup No. 2. ...while Bill uses the hot iron to shrink tape onto the curved surface on the inner end of the wing. Peter and Bill appear to be offering their thanks to the deities of the air. But, actually they are checking the fit of the felt underlay on the leading edge of the third wing. ...while Bill studies the underside of the lower wing prior to adding the aileron fairing. Two wings are in the finishing stage, with only two more to go! Sam carries the lower engine cowl for Pup No. 1. Ray stands back to admire the handiwork of Team Sopwith in fitting the engine cowl. The engine side cowls are fitted showing the streamline appearance for the first time. How long now until, "Fuel, Action, Camera"? Vimy Flight Team lead and pilot, Allan Snowie, takes Sopwith Pup #1 out for a Remembrance Day taxi test and to pose "Betty" for the CBC camera. It is her first public appearance on the runway and she is getting ready to take to the skies soon. CBC crew document the Pup in action. The Pup glides to a stop after another test run. On the 10th of November a milestone event occurred - for the first time the engine in Pup No. 1 was run after installation in the aircraft. The wings were attached, the aircraft rolled out of the hangar and fueled. After last minute checks the starter was cranked and the engine burst into life. After a number of shut downs and inspections it was time to make motion. Pilot, Allan, took the aircraft for a short taxi near the Museum. Then it was a shutdown and discussion over some minor items. The braking was good but the aircraft did not turn as smoothly as desired. After adjustment of the linkages and a shot of grease in the strut, it was time for another test run. This time, Manager Mike repeated the taxi test with significant improvement. A Pup as a monoplane? No, the process of fitting all four wings is under way. ... and with the engine running. Now it is time to get under way. The Pup taxis near the Museum to test the steering and braking system. adjustments to the tailwheel steering system to make it more responsive. Work on the fabric covering of wings and tail components for Pup No. 2 is well under way. Air Cadets Chris, Felix and Rohan attach the reinforcing tapes to one wing. engine runs leading to the first flight. from real leather as in days of yore. The wings are getting their final prep before the exacting job of covering them with flightworthy fabric begins. The wing centre-section is getting its final touches before the finish is applied. The lower surface of one wing has received its fabric covering. Air Cadet, Felix and volunteers Al and Wayne mark out the fabric of a flight control. ...while Bruce has the solitary task of preparing reinforcing patches. One of the wings has the fabric-covering process underway as other wings are prepared. The pace continues with the construction of Pup No. 2. The bare airframe has now been dismantled and detail work is in progress on covering the wings and components with synthetic fabric. to the control surface. Gives a new meaning to the term 'Ironman'! The next component to come under the care of the assembly team is the vertical tail surface. The special adhesive has been used to glue the fabric to one side of the stabilizer. about attaching the fabric to a curved tubular structure without leaving a wrinkle! So what are the tools of trade of these creators of ancient aircraft - multi-million dollar computer-controlled machines, giant autoclaves? Not! an awl - and a rubber block for removing excess glue. The Museum would like to say a big "Thank You" to corporate sponsor Home Depot for the donation of shelving to help keep the supply line for the two Pups organized. The construction of the Pups is by far the biggest project the Museum has undertaken and everything to help is greatly appreciated. Now every component and tool will have its proper storage place. After a busy summer at the Museum, September shows the construction of the Sopwith Pup replicas still making rapid progress. The first Pup is substantially complete with final work on the engine and cowls under way. The second Pup has had many of the fuselage components added and has now had the wings fitted for the vital fit and clearance check of components before the fabric covering is started. to the fuselage before being dismantled to start the fabric-covering process. Here we are in June and the rollout of the first Sopwith Pup is nearing. How are the construction crews coping with the stress of the deadline? They are hurrying in a very constrained manner in keeping with the principles of aviation. Every construction step is double checked before the next process is started. A Government-approved inspector keeps his eye on the project to ensure safety goals are reached. The combined talent of the crews is probably in the hundreds-of-years category - much more than that of the original Sopwith factory, it is assumed. The many talents of the Museum volunteers are surfacing - saddlemaker, signwriter, upholsterer, avionics technician, licenced aircraft engineer, machinist, auto mechanic and not a few antique aircraft buffs. Throw in a few pilots and you have a mix of skills that cannot be equalled. As June draws to a close, the pace continues for the Pup builders. The fuselage of the second aircraft is in the hangar getting its preliminary fit-out for the firewall and engine. Meanwhile, the first Pup has had its wings clipped to give more space for its sibling. Work will continue on finishing the engine installation. firewall is a standard piece of aircraft construction between the engine and the rest of the structure. Kevin checks that the machine gun will be adequate for dispatching enemy aircraft. So what happens when a plane is ready for its first flight? Does the test pilot just hope that everything will work out Ok? Or does he sweat it out the night before and make sure his parachute is ready? None of the above, fortunately. Since the early days of flight, the process of getting an aircraft ready for test flying has been well established. The process of computing the weight and balance of an aircraft is detailed in technical manuals. Here is the first step - the weighing of the aircraft. done to ensure that the aircraft is in balance and neither too nose-heavy nor too tail-heavy. The Pup has its feathers! The tail structures and all four wings were fitted today. Team Leader, Ray, poses with the vertical stabilizer after the horizontal stab. and elevator were fitted. The completed tail end showing its classic Sopwith shape. Sam catches a quiet minute to do the final lettering. The move is on - the Pup is moved from its assembly position to the final assembly line. The cheerleaders move into place to cheer the workers on - Annette and Bernada. ...followed quickly by the lower right. The upper left is swung into place. How many men does it take to put on a wing? Phil, Kevin, Roy, Wayne, Jim, Ray, Al and Peter make up the crew. Bolts, camera, action - the upper right wing is secured. The Pup is resting quietly after all the action, finally having a feeling of completeness. the original logo for the aircraft flown by Flight Sub-Lieutenant Joe Fall of Vancouver Island. Above, Gord gets his exercise by connecting the hardware to the upper-wing centre section. Now the details are filled in. But what is this? A different name on the other side? What is going on here? The engine has been installed and the detailed work of hooking up all the connections is under way. The spun-aluminum cowl is being fitted. The cockpit fitout is nearing completion. The fuselage has its UV protection completed and is now in the rather modern RCAF low-visibility grey colour - but not for much longer. The fuselage is inverted to allow fitting of the landing gear. The rest of the Museum's flying fleet await the arrival of the litter of Pups. Al prepares the axle to receive the wheel, while Bernada lends a helping hand. Wheels down and locked! Al, Bill and Phil confirm all the hardware is in place. The landing-gear crew dodge splatters of the olive paint that Roy is meticuouly applying. All the external finishes are user-friendly and so can be applied in the hangar without special measures. Do you remember the previous entry under 'Lord of the Rings'? Well, here is part 2 of the story. After the rings were glued in place, the finish was applied to the surface, then the roundels painted. But closer to flight time there comes a time when the flight controls have to be connected inside the wing. cover the holes to keep the aerodynamic shape - and to keep the starlings from nesting! being applied. The final wing - #4 - has had the four UV layers applied and is awaiting its distinctive camouflage color. Kevin, Ray, Bill and Air Cadet Alex, prepare the fuselage side for the reinforcing tapes. finishing tapes. Jim, Air Cadets Terry and Felix, with Bill and Sam make it all happen. the fabric before the next layers are sprayed on. ...to a ballroom beauty under the careful eye of Jim handling the calibrated iron. The leather cockpit surround is complete and ready for installation. ...and in no time the artwork is coming to life. Wing No. 3 has the first coat of finish applied by brush to ensure good penetration of the fibres. In the background are the two completed wings, with prep work on No. 4 started. gun to fasten the tubular rivets that hold the fabric to the structure on wing No. 4.
of a fabric wing? There are no easy, hinged inspection panels as on a metal wing. 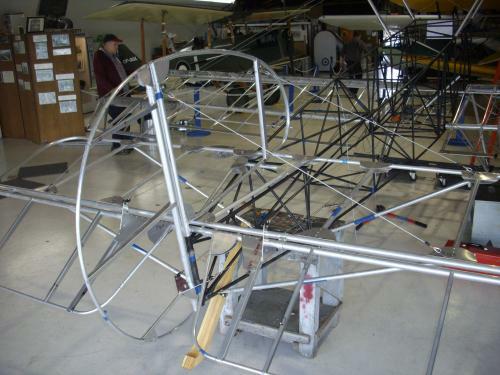 Instead, plastic reinforcing circles are glued onto the lower wing fabric during construction. prevent the aircraft from flying away on a windy day without the pilot. showing the classic streamline fairings of the original. - in the first stage of covering the rear fuselage. At last! The faithfully recreated logo of the Sopwith company now adorns the vertical tail of the Pup. No computer graphics and vinyl lettering for this classic - all authentically created by volunteer Sam. ...and indeed have been completed on one wing by Sam! Meanwhile, the painstaking work of fitting out the cockpit continues. The wiring is complete and the instrument panel is being prepared. The authentic goat-hide cockpit surround is being manufactured from scratch by Jeff. Even to the correct details for the lacing of the edges. Hey kids, do you want to see the secret construction plans for the Pup? Progress on the build of the first Sopwith Pup continues unabated. Work on all four wings is under way - #1 being painted, #2 prepped for painting, #3 having the fabric applied, and #4 having the under-tape and leading edge felt applied. Our electrical team have competed the wiring for the electrical system within the cockpit area and prep work for the fabric covering of the fuselage has begun. Jim, Wayne, Phil, Kristin (Air Cadet) and Jeff. rim to the cockpit of a Pup?" Volunteers, Wayne, Jeff and Bill will find a way. continues with the fitting of the brakes. What's this? - brakes on a 1917 aircraft? Yes, as a concession to paved runways and safety, the new Pup will have brakes. Work on the fabric covering for the fuselage continues while the top cover patrol circles overhead. The covering process for the fuselage is now under way. color scheme as shown by the Museum's flying replica of an SE5A in the background. Roy and Bill start the fabric covering process for wing #3. The covering is laid over the wing and the edges secured with the special adhesive. The lower covering is wrapped around the leading edge of the wing and more adhesive applied. Meanwhile, Ray applies the UV-protective undercoat to wing #1. 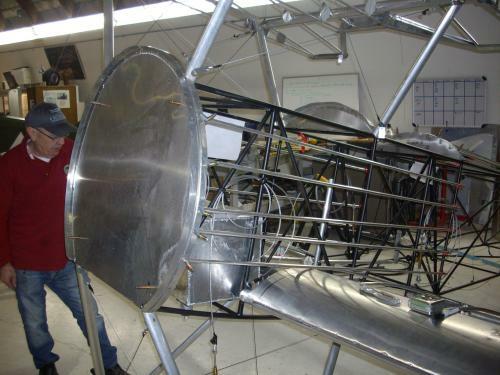 Rapid progress is being made on the construction of the first Sopwith Pup replica. So what happens when the gun fires toward the propeller? We will find out during the test flight. Wheel alignment? Yes, we do them too! Al checks accuracy of the wheel/brake combination. Alf paints the wing centre-section after the UV coat has dried. Non-toxic materials are used throughout, allowing work to be done while visitors watch. Ray applies another coat of primer to prevent UV rays from harming the surface. Covering of the wings has started with Kevin applying the calibrated hot iron to shrink the fabric. Meanwhile, Phil and Ray complete another trial fitting of the horizontal and vertical tail surfaces. Covering strips are applied over the rivets and to all edges. Steel cables form bracing wires to give structural integrity to the wing. Tubular rivets hold the fabric to the metal structure. Our 'weekend warriors' include these Air Cadets from Langley and New Westminster. The covering is attached with special adhesives then shrunk at 250F with a hot iron. The centre-section of the upper wing is having the fabric covering applied. The process is by Stewart Systems - a water-borne, non-toxic process. With inspections complete the upper surface is readied for covering. checked to ensure accuracy before the fabric covering is completed. under the A Nation Soars banner. The Pup rudder after the first stage of the covering process with a tight fabric surface. The engines for the two aircraft are being prepared for service. Authentic? Yes, right down to the wooden tail skid. The cockpit surround has been completed, while the instrument panel is being prepared. Forward fuselage fitout is continuing with wheel brakes and pilot's seat being fitted. Both lower wings have been trial fitted to assess the fit of the wing and fuselage joint. The firewall is getting attention prior to receiving the engine. The vertical tail displays the classic Sopwith profile.